Growth is slower but continuous, spurred by automotive, energy, wireless and healthcare. Semico forecasts the 2012 analog market will grow 5.1% to $44.5 billion, up from $42.3 billion in 2011. This is higher than the 0.1% analog revenue growth experienced in 2011 but lower than the 12.6% growth expected in 2013. Growth is coming from automotive electronics, the energy industry, wireless communications, and healthcare diagnostic and monitoring devices. 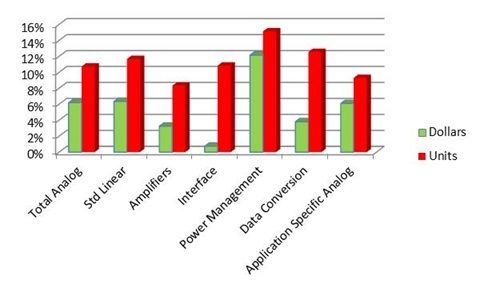 In a recent review of the analog manufacturing landscape, Semico found 50 IDMs and fabless companies with power management products. That’s more than half of the 90 total companies in the analog market. Semico predicts that power management revenues alone will reach almost $10B this year. Power management makes up 22% of the analog market’s total revenues, and a whopping 38% of units. It is the largest segment of the general-purpose analog market, in terms of both revenues and units. Our forecast is for continued growth in power management. By 2016, 62.6 billion power management chips will ship, generating more than $15 billion in revenues. Power management is an attractive market because it is such a fast-growing market. But in addition to being one of the fastest-growing analog markets, power management devices have not suffered significant price erosion as other product categories. For example, data conversion circuits have grown at a CAGR of 13% from 2001-2011; however, over that same time period revenues have only grown by 3.8% CAGR. The semiconductor industry is seeing a rise in more sophisticated power management designs using mixed signal and taking advantage of the more advanced process technologies. However, analog and power don’t shrink as well as logic, so there is less benefit to moving to smaller process technologies. Analog/mixed signal designs can stay on a given process node for 5-7 years. In today’s market, new applications and increased volumes are dependent on lower costs. One of the ways to reduce cost is to move to a larger wafer size. As production at 65nm and smaller nodes becomes more widespread, we will see higher adoption rates of 300mm manufacturing, since those nodes are more likely to be processed only on 300mm wafers. Texas Instruments took the lead in the 300mm transition with its RFAB, and then Maxim announced it was running 300mm wafers at its foundry partner, Powerchip. Infineon recently announced the production of power discretes at its 300mm facility, so it is likely to add analog production there as well. The question before us is, ‘Who will be next to announce 300mm analog production?’ Will the analog industry become a case of the “haves” and the “have-nots,” those with 300mm capacity or a foundry partner, and those without?